Are These the Actions of an Evil Regime? Israel, the Apartheid State. The government that is persecuting Palestinians. The regime committing genocide against the people of Palestine. Really? Does this sound like a country that would be taking care of the wife of the leader of the Palestinian authority? 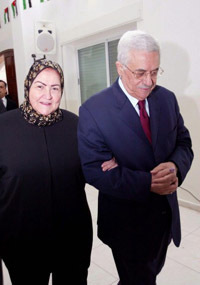 Well that is exactly what happened this past weekend as the wife of Mahmoud Abbas had leg surgery in a hospital near Tel-Aviv. But did the fair-minded speak out about this? Did they ever stop to consider what would have happened if three Palestinian students had been kidnapped and Israeli Prime Minister Benjamin Netanyahu’s wife would need surgery in most Arab nations? Or even closer to home in the West Bank or Gaza? As three Yeshiva students remain missing, likely kidnapped by Hamas or another similar terrorist organization, the Israeli government welcomed in and allowed the wife of Abbas to be cared for. Does this strike you as the behavior of a state motivated to wipe the Palestinians off the planet. Does it look like a government lacking in ethical human rights behavior? We all know the answer. Roger Waters knows the answer. Emma Thompson knows the answer. Alice Walker knows the answer. But these phonies, Anti-Semites masquerading as humanitarians would never utter the words of truth that are so evident from the events taking place. The worldwide movements to discredit Zionists, a smokescreen for decreasingly less subtle attacks on Jews, would never declare the truth about Israel, that it is a true democracy with true freedom and the highest level of human rights. To do that would result in elevating the status of Jews worldwide, which in reality is why it is not done. If you doubt this to be true just look at what it is happening in France on a regular basis to people because they are Jews, not because they are Zionists. And look at the recent murders in Brussels and wake up to the truth. And that truth is that there are people who want to wipe the Jewish people from the planet, regardless of where they live. We all say Never Again to something that on some very frightening levels has begun to happen again. Did we ever know what we would do to stop it if it did? Maybe not. But it starts by seeing the reality of the situation and not closing our eyes, pretending it is not there and hoping it will go away. That never worked and never will.